And I'm feeling rather sad. So... here's the final sketch, and I thought I ought to challenge you a bit. 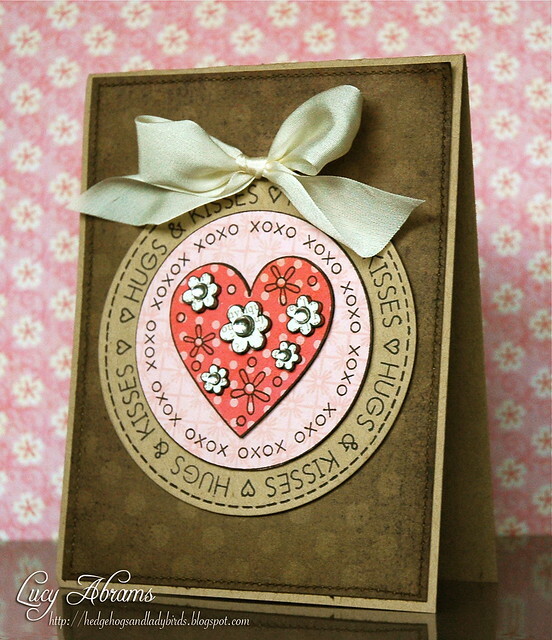 I chose the perfect stamp for this sketch - Hero Arts Hugs and Kisses cling stamp (on sale Here). Isn't it adorable. A perfect Valentine stamp. I just stamped it onto 4 different papers and paper pieced it all together, using foam adhesive between the layers. I added some Smooth Gemstones to the centres of the flowers for some shine. So... I hope you join in. And I hope you have enjoyed the week. Let me know if you'd like me to do another sketch week in the future. PLUS - if you are good girls, I might consider creating a PDF of all the sketches so you can print it out. ;) Someone suggested this and it seemed like a nice idea. I too have been watching, not making anything, but I love your sketches. A link to a pdf would be great, for future reference. Thanks for all these nice sketches. I'm gonne make them all as soon as I have time! I hope you will post othter sketches in future, because I think they're great! This has been fun Lucy, thank you! Off to go and play with this fun sketch! 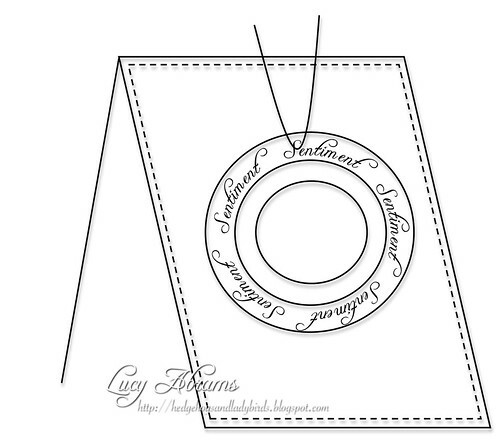 Thanks, Lucy, for leaving the challenges open; it's a busy time right now for me, but it should lessen after mid-month, and I hope I'll be able to play......I need to learn how to make simpler cards like you do, and here's a shining chance to do it! I enjoyed this week. Every day I looked forward to see your cards. They all are beautiful! Love this one, Lucy! My fave of the week! Beautiful! Sweet design - love it! Love your sketches and your cards. Yes please do another sketch week in the future! This is such a beautiful card and I love the design. Thanks for your sketch week. Hello!! I found your blog last week and I just completed all the sketches! I'm so happy!!! I think "Day 3" is on my blog now and 4-7 are set up for consecutive day postings!! So much fun!! Thank you so much for doing these!! Thanks for the week of sketches! I'm sooo not a sketch person, but I really had fun with these! Thank you so much for helping me step out of my comfort zone!